In the latest effort to preserve the Lytton Savings Bank building, the Los Angeles Conservancy today filed a lawsuit in L.A. Superior Court arguing that the City of Los Angeles did not comply with the California Environmental Quality Act (CEQA) in its review of the 8150 Sunset Blvd. project. The Lytton Savings Building was designed by noted Southern California architect Kurt Meyer. 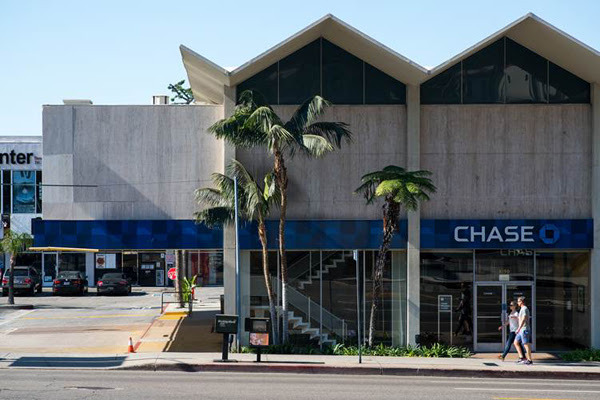 Now a Chase Bank, the building with its zig-zag folded plate roof, glass walls and interior art work offered a radical architectural departure from traditional bank buildings when it opened in 1960. In mid-September the L.A. Cultural Heritage Commission unanimously agreed to recommend landmark status to the building. The building sits on a site at the southwest corner of Sunset and Crescent Height boulevards where a developer plans to build 229 residential units and 65,000 square feet of commercial space, with plans for a grocery store, restaurants and retail shops. The project is being designed by the firm of noted architect Frank Gehry. The City Council’s Planning and Land Use Management Committee (PLUM) on Oct. 25 approved the 8150 Sunset project but delayed consideration of whether to recommend designation of the Lytton Savings building as a historic cultural monument. Then on Nov. 1 the full L.A. City Council endorsed the 8150 Sunset project without the Lytton historic designation on its agenda. On Nov. 22 PLUM took up the question of whether to support the historic cultural designation. But rather than making a recommendation, it sent the question to the full City Council for its decision, which has yet to be made. A decision to designate the building as a historic cultural resource will complicate plans of the developer, Townscape Partners. Such a designation means the developer can be forced to wait 180 days for the city permit required to demolish the building. That period can be extended another 180 days with the approval of the L.A. City Council while preservation alternatives are explored. Some preservation advocates have argued that Gehry should incorporate the building into the design of his project. Another option, viewed as impractical by some, is to move it. Gehry himself said a construction crane will need to be placed where the Lytton building now stands. In its lawsuit, the Conservancy says that the City of Los Angeles ignored the fact that a report on the environmental impact (EIR) of the 8150 Sunset project identified the Lytton building as meeting standards to be designated a historical resource. It identified two preservation alternatives that would have allow the building to be incorporated into the project. Under CEQA, a project must avoid significant impacts such as the demolition of a historical resource if the fundamental project objectives can be met without demolition. “While the City claimed that the EIR’s preservation alternatives were not feasible, its findings were contradicted in the EIR and were not supported by any substantial evidence,” the Conservancy said in a press release announcing the lawsuit. The 8150 Sunset project sits on the northern border of West Hollywood and will be on the WeHo City Council’s agenda on Monday. The council will be asked to authorize the city’s Community Development Department to select a consultant to design a cul-de-sac on Havenhurst Drive, with is on the western border of the 8150 Sunset project. That cul-de-sac would force traffic from the 8150 project to head north to Sunset Boulevard rather than south through the Havenhurst residential area. The city negotiated a deal with Townscape Partners in which it dropped its opposition to the project in exchange for Townscape’s agreement to fund construction of the cul-de-sac, move building equipment farther away from the WeHo border and pay for improvements in West Hollywood’s sewer system. L.A. City Councilmember David Ryu negotiated an agreement for Townscape to reduce the size of the tallest building on the site by 100 feet. I’m glad the neighbors have done the work they did – without it LA would not be prepping for a new Gehry and we’d have that generic design originally proposed. With that, the conservatives time in this play should conclude and make way for the inevitable progress we can all enjoy. I can’t remember anyone caring about that bank until it provided an opportunity to halt the corner. That’s all this is, it has nothing to do with the bank and everything to do with the Gehry. The best part of the Chase is the interior work, and from what I can gather that will be included in Gehry’s design (hope so). Win for LA, both for current and future Angelinos. Where are you going to Development Woes? Keep it local and in WeHo and you do not have to worry about traffic congestion. Bike – Walk – Take the Bus and snooze. We no longer need to have our lives directed by gas guzzling cars like decades before that got us in to this congestion nightmare in the first place. “The kids these days” and “traffic”…said every generation ever since the automobile. I drive by Disney Hall regularly and still find ways to get my business done and spend my nights at home. I won’t entertain the fear mongering, it’s just not worth the energy. Can’t wait for the evolution of the corner and for us to embrace the future instead of trying to roll back the clock. Nostalgia can be well and good, but look what that got us in November… Let’s move forward together! Tom, you won’t e en be able to get close to the corner of Sunset & Crescent Heights where the massing of the FOG project virtually as substantial as Disney Hall. Traffic will be frozen in place and horns & sirens will pierce the eardrums of anyone within a mile. LOL! Sunset, Crescent Heights and Laurel Canyon would need to be elevated to “Walk Streets”. There have been plenty of buildings worth preserving. This is not one of them. As I see it, tear down that basic bank and let Frank Gehry evolve the corner to something we can all be proud of!